Auto Galaxy Marijuana is an autoflowering strain, a cross between an Indica Afghan and Northern Lights. Intense fruity flavor, great productions and a pleasant relaxing effect that will leave you at peace with the world. Auto Galaxy is an automatic strain created by crossing an Afghani and Northern Lights, very similar to the non-automatic Galaxy strain. It is characterized by putting at your disposal a pleasant and sweet fruity flavor with a minty touch, nothing to do with the typical dry grass flavor that most autoflowering varieties have. Auto Galaxy will award you with a mild effect hitting in a very corporal relaxing way that will gently invite you to lie on the couch and to think about the miracles and wonders of the galaxy and universe. As a plant, Auto Galaxy does not grow too much and is therefore a small and manageable specimen with heights of ranging from 50cm and 130cm. 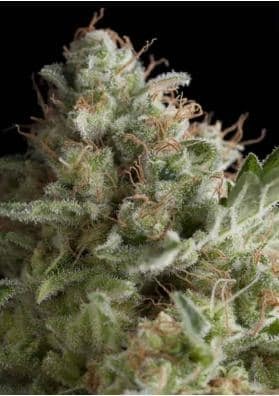 According to Pyramid Seeds, is one of the most productive plants, although you must provide it some type of restraint since it grows relatively fast and its branches are somewhat thin to support the weight of their abundant and resinous buds. In a growing room, it grows like any automatic with a daily light regime of 20 hours and with a lamp of 600W and in only 7 weeks this space traveller will offer you considerable yields of half kilo per square meter. In the garden, it takes about 50-65 days to bloom and will give you between 40-150 grams per plant.